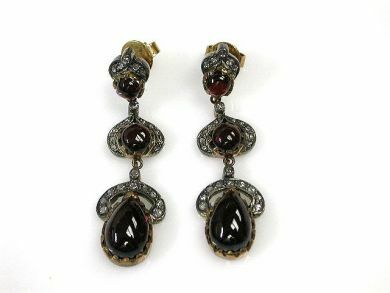 A wonderful pair of 18kt yellow gold and silver top earrings featuring 4 round cabochon dark reddish brown garnets, est. 3.28ct; 2 pear cabochon dark reddish brown garnets, est. 11.25ct and 52 rose cut diamonds, est. 0.43ct (SI2-I1 clarity: I-J colour).